South Pacific Meats has been fined $23,000 after being found guilty of negligence in a 2010 saw accident in which a man lost part of his thumb. 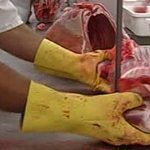 Yesterday was the conclusion of the long-running legal battle between the Awarua meatworks and the New Zealand Meat Workers Union, which brought a private prosecution on behalf of Henry Kingi. The case took more than eight days of the court’s time spread during several months at Invercargill District Court, in front of Judge Alistair Garland. SPM was found guilty of failing to take all practicable steps to ensure the safety of Mr Kingi, a trainee sawman, who cut off the top of his thumb while struggling to keep up with the workload on the plant’s shank saw. Mr Kingi had told the court he received only a small amount of training on the shank saw and had asked his supervisor to assign him another job following a 10-hour shift the previous day. Judge Garland found SPM had failed to provide adequate training and supervision to Mr Kingi. It had also failed to provide a table which could have allowed him to stack product if he could not keep up with the speed of the chain, which contributed to the accident. However, Mr Kingi was partly responsible because he had been smoking cannabis prior to coming to work, Judge Garland said. Yesterday, prosecution lawyer Lauren Beecroft said there had been significant safety lapses at the plant. Basic steps which could have been taken were not taken, she said. “There were system-wide failings across the board … they had good systems on paper but the reality was far different,” she said. In mitigation, defence lawyer Mark Hammond said while the training and supervision given to Mr Kingi was inadequate, the fact he was given some of both meant the company did not deserve a fine at the upper end of the scale. Since January 2010, SPM had replaced the shank saw with a new, safer model and implemented new health and safety systems, Mr Hammond told the court. Judge Garland said if Mr Kingi had not been smoking cannabis, SPM could have faced a fine of up to $45,000. Given the contributing factors and mitigation, he said a fine of $23,000 and reparation to Mr Kingi of $5000 was appropriate. After the hearing, Meat Workers Union Southland-Otago branch secretary Gary Davis said the union had used Mr Kingi as an example of someone who had been injured at SPM. “It’s satisfying to get a result,” he said. As a result of the case SPM had brought in new machinery to make workers safer and the Labour Department would be keeping a closer eye on them, Mr Davis said. SPM manager Kevin Hamilton said the company would not comment on the outcome of the case.